Marilyn SanClemente August 4, 2016 August 10, 2016 3D Item, Christmas, Christmas in July, Stampin' Up! 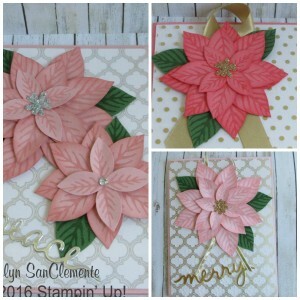 Today I am sharing three 3D Poinsettia cards made with the Stampin’ Up! Reason for the Season stamp set and the Festive Flower Builder Punch. I purchased the Reason for the Season set and coordinating Festive Flower Builder Punch last fall when it came out since poinsettias are my favorite Christmas flower. But unfortunately I never got the chance to use the set. So last week I decided to pull out some of the Christmas sets that I had purchased last year but didn’t have time to use. So they were incorporated into my Christmas in July class for this year! So here we are. I am loving this new Fabulous Foil Designer Acetate. This product is a window sheet with designs stamped in gold and silver. If you use one side it is gold and flip it over, it is silver. What a great idea! I can see some really pretty wedding invites with this acetate too! Ok – so for the details of these cards. I made this card using the 3 different shades of pink cardstock. The top left is Blushing Bride, then Flirty Flamingo and then Pink Pirouette cardstocks. 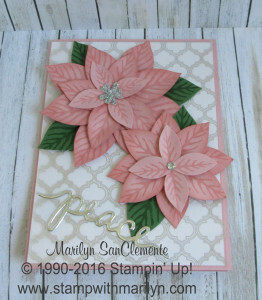 For each card, I used the coordinating ink to stamp the poinsettia petals. The leaves are Garden Green card stock with Garden Green ink. The base of each card is the color of the flower for that card. Then I layered a 5 1/4″ x 4″ piece of Whisper White Cardstock. Next is a piece of the Fabulous Foil Designer Acetate cut to the same size as the white piece. The large flower is made using 8 Large petals stamped and punched from the Blushing Bride cardstock. There are 4 medium petals stamped and punched and 2 of the small double petals. I used a 1 1/4″ circle (the size of the circle doesn’t matter) to build the flower. The Fine Tip Glue Pen was used to put the flowers together. The smaller flower is 8 Medium petals and 2 small double petals. I used the Christmas Greetings thinlits to cut out the Peace and Merry from Silver and Gold foil to match the side of the acetate that I used. And to make it easier I recorded a video with all the details.